An Afghan family ride on a bike past the site of a car bomb attack where U.S. soldiers were killed near Bagram air base, Afghanistan, April 9, 2019. Injured men receive treatment at a hospital after a clash between Taliban and security forces in Kunduz province, Afghanistan, April 13, 2019. The insurgent offensive promptly drew strong condemnation from Zalmay Khalilzad, who is leading the American team of negotiators discussing a possible peace deal with the Taliban. He denounced the offensive as "reckless." In turn, the Taliban slammed Khalilzad's remarks and justified the offensive, citing the continued U.S. "occupation" of Afghanistan. The war of words raised questions about the fate of the ongoing U.S.-Taliban talks. 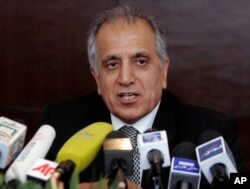 FILE - Zalmay Khalilzad, special adviser on reconciliation, speaks during a news conference in Kabul, Afghanistan. Khalilzad noted in a series of tweets that in discussions with Taliban interlocutors he had proposed ways to reduce the violence, and lamented that years of hostilities have killed tens of thousands of innocent civilians. "The quickest way to prevent casualties is to agree to a ceasefire. Taliban senior leadership should allow their representatives to come to the table and discuss. I will continue to press the case," said Khalilzad, the U.S. special representative for Afghanistan reconciliation. "So the dialogue possibly will take place after the intra-Afghan dialogue. But the date is not fixed yet," said the insurgent official. He spoke on condition of anonymity. The intra-Afghan dialogue the Taliban official referred to is a two-day informal meeting scheduled for Friday (April 19 ) in the Qatari capital of Doha, where politicians, tribal elders along with representatives of civil society, women and youth from the war-ravaged country will interact in their "personal capacity" with Taliban delegates on the current crisis facing Afghanistan. Envoys of the Kabul government are also expected to be part of the discussions but not in their official capacity. 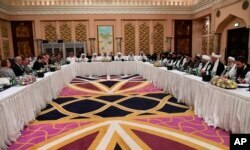 FILE - This photo released by Qatar's Ministry of Foreign Affairs shows Qatari, U.S. and Taliban officials conferring in an undisclosed place in Doha, Feb. 25, 2019, ahead of the latest round of talks with the insurgents aimed at ending the Afghan war. "The problem is that the Taliban, which enjoys ample leverage, is unlikely to take any interest in one until the two sides reach an understanding on a troop withdrawal plan," tweeted Kugelman, who is the deputy director of the Asia program and South Asia senior associate at the Wilson Center. 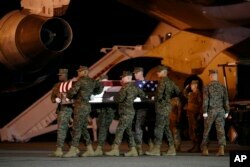 A U.S. Marine Corps carry team moves a transfer case containing the remains of Staff Sgt. Christopher A. Slutman, April 11, 2019, at Dover Air Force Base, Del. A visiting Democratic lawmaker Monday reassured Afghans the United States does not want to pursue a "precipitous" troop withdrawal from the country. "What we've heard here [is] that whatever negotiated settlement ends the conflict, that it be done in a way that's very deliberate, that ensures a transition that all sides can participate in, and that there should not be a precipitous withdrawal from Afghanistan," Democratic Senator Jeanne Shaheen told reporters at the U.S. embassy in Kabul.